This January, Hali and I went with fellow bloggers to a newly opened private resort in Antipolo – Tyvo Resort. Tyvo Resort (pronounced as tay-vo) is fairly unheard of currently because it has just opened its doors to visitors last December 2018. It’s located in a beautiful mountainside, just a 5-minute walk from Pinto Art Museum, and caters to families and friends. 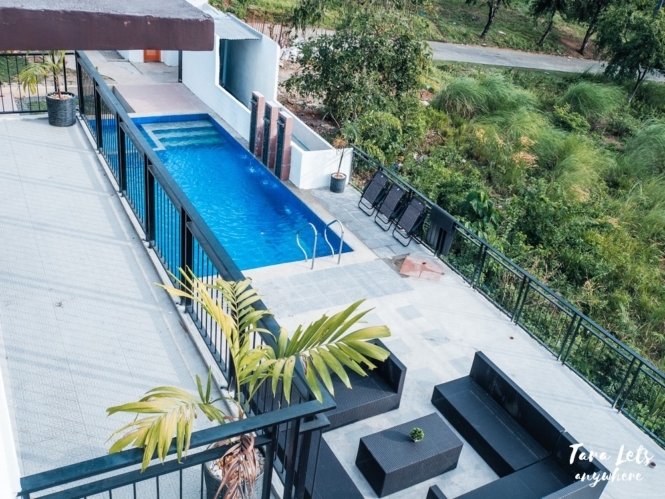 In this post, we’re going to tour you inside Tyvo Resort in Antipolo, Rizal. When Hali and I arrived, what I noticed first is the view. 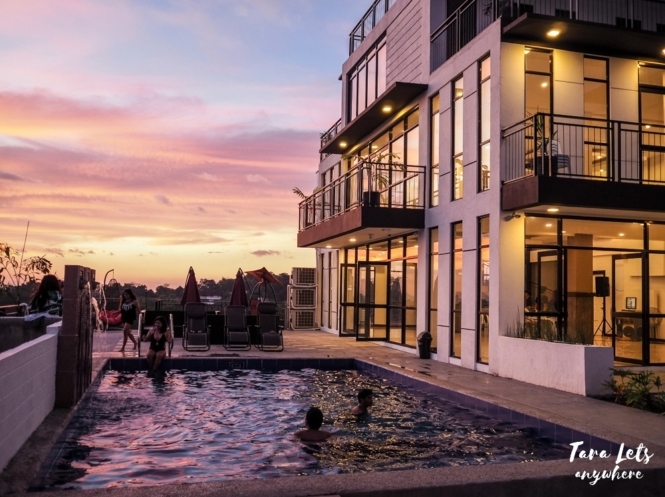 Like other places we’d been to in Antipolo, Tyvo Resort has a gorgeous mountain view that overlooks the cityscape of Metro Manila and Laguna de Bay. It’s one of its main selling points, and there are plenty of areas where you can hang out and gaze at the panorama. Considering its location, it’s cold in the resort and I wish I’d worn longer fabrics or at least worn a jacket. Hi from us (Katherine and Hali)! We explored the resort’s 3-story building. There’s a huge function hall where tables were set up for us and a grand staircase leading to a balcony on the second floor. The whole balcony itself was empty — I was amazed at this huge space dedicated specifically for event functions. Usually resorts use every inch for bedrooms and lounges, so this was refreshing. It’s easy to imagine a debutante or newly weds going down the staircase to an applause from the waiting crowd below. At this time, the rest of our group were already singing away in the KTV room in the basement, while Hali and I stayed in the poolside area. Everyone then moved to the function hall, where there’s a separate videoke. I find this very convenient. So I mentioned that this is a blogger’s invitation. Hence there were short introductions and meet-and-greet. The vibe is fun and youthful, since the group is composed of millennials and most of us had been blogging only for a while (our blog is only 3 years old). I appreciate a gathering like this, since when we started blogging, I didn’t really know anyone else and had even written about how it was challenging to find friends in the blogging community when you’re a newbie. The venue is perfect for our little get-together because it provides entertainment such as pool and videoke use and, at the same time, there were sparse houses and establishments in the area so it’s generally peaceful and quiet. Later on, we tested out the pool. We were looking forward to this because the pool looks enticing in online photos. There’s a small area for kids, which I’d initially mistaken to be a jacuzzi. The pool is deeper than most, at about 5 feet, and it slopes downward so that halfway through I couldn’t reach the floor on tiptoes. Hali encouraged me to swim across and apply what we’d learned in our last freediving lesson, although as expected I still got terrified and stayed on the safe side. Still, I enjoyed our time in the pool. There were jet streams with hot water which felt good on the back. I later learned that the pool has an optional heater, which I regretted not using because it would’ve been great to soak in a hot pool to counter the cool temperature. The resort provided us dinner, lomi and dinakdakan, both of which were good. I appreciated the lomi in particular because it warmed up my insides, and if you’re going here, I suggest adding soup into your prepared menu as well. Hali and I stayed a little outside after dark. The resort transforms into something more classy at night. There are warm lights in the building and blue/indigo lights in the pool. Even the view from here changes — from an ordinary urban spread in the daytime to a canvas filled with splashes of pink and orange at sunset and finally a star-studded cityscape at night. At past midnight, we decided to hit the sack. We stayed in one of the dorm rooms. The dorm rooms are acceptable, although if you’re maarte and a light sleeper like me, you’ll do better in the single rooms which offer more privacy and comfortable mattresses. Tyvo Resort is a private resort located in Antipolo, Rizal. It’s ideal for casual get-togethers and even special events, such as birthdays, pre-nuptials and small wedding celebrations. Ride a van or jeep to Antipolo (there are terminals in Megamall, Cubao, etc). 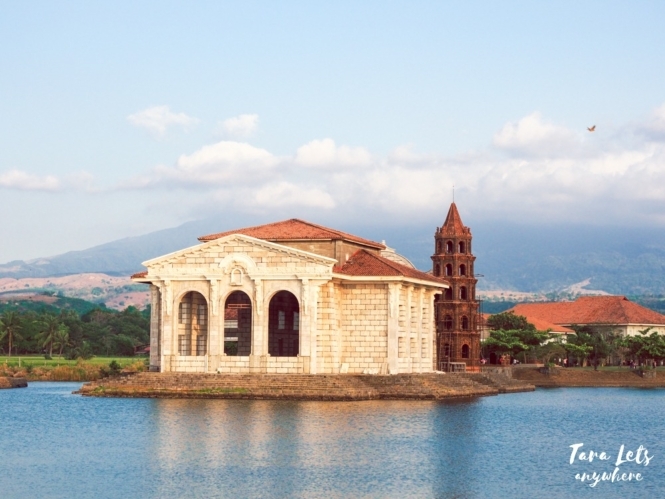 Get off at Ynares Sports Arena or Antipolo Church and ride a tricycle to Tyvo Resort. If you have a private car, you can use the C6 and C5 roads to get here. Tyvo Resort is just an hour away from Ortigas Center. There’s a maximum of 20 pax per booking, with additional P100 per pax. The basic package includes 2 non-AC dorm rooms. There’s an additional fee for using the aircon. There are also 2 single bedrooms (good for 2 pax) at an additional cost as well. Grand staircase leading to balcony. During our visit, there were no utensils provided so we had to bring our own. If you don’t want the hassle, perhaps you can negotiate this with the resort owners. Also, take note that there are no nearby stores in the area. You have to drive outside the subdivision to get to a grocery/convenience store, so it’s best to double-check that you’ve already brought everything with you. Finally, the pool has an optional heater. It takes 1-2 hours to warm up, so you might want to advise the caretakers to get it ready ahead of time. Also, the kid’s section isn’t exactly separate from the main pool and the pool itself is deep, so you need to watch over your kids when swimming (and yourself, if you’re not a good swimmer). For inquiries and reservations, you may directly message the resort in these pages: Facebook page / Official website or email them at admin@tyvoresort.com. Make sure to follow them in their Facebook page because they occasionally announce promos especially during weekdays. Don’t forget to drop by Pinto Art Museum, which is just walking distance to the resort. The museum is open from 9AM to 6PM. Disclaimer: Thanks so much Katrina Tiong of Happy and Busy Travels for inviting us and Tyvo Resort for accommodating our group! As always, opinions are my own. Uy ang ganda dito! I live in Rizal so it’s just near us. Perfect for family and friends. Love it. I love the resorts in Rizal! Maybe you can recommend others? I like the way you enhanced the photos. It looks more gorgeous in the evening. Ok na din yung accommodation for a short overnight stay 🙂 I’m not picky when it comes to that for as long as it is clean. Hi Danica, I did minimal editing on the photos for sunset/night captures – mainly just lightened the shadows. The raw pics are good already, and if you see it, especially the sunset, you’ll see that the colors and the sky are very much alive.